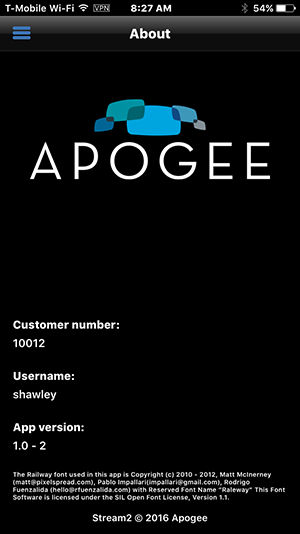 If you are contacting Apogee for Technical Support, you will be asked for the version number of the Stream2 app. This is how to find it. 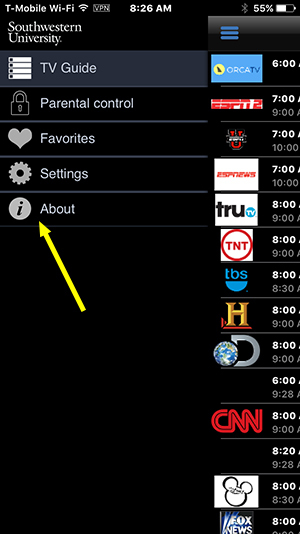 After launching the app, you are presented with the Stream2 ‘TV Guide,’ also called the Electronic Program Guide (EPG). From the ‘TV Guide’ screen, tap the icon with three horizontal bars, or swipe the screen to the right to expose the main menu, and select ‘About.’ The App Version number is near the bottom of this screen.